Eating disorders refer to the conditions of abnormal eating habits, which might include eating too much or eating too little. Though there are many eating disorders, there are a few common ones. 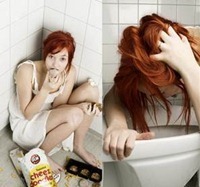 The most common eating disorders are binge eating disorder, bulimia nervosa and anorexia nervosa. These eating habits can lead to serious physical and emotional problems for those who suffer from them. It is recommended to seek medical help as soon as possible. In this disorder, suffers often consume large amounts of food at one time. Those who have this problem should seek immediate help, as the issues usually doesn’t go away on its own – it takes medical intervention to get over a binge eating disorder. Symptoms. 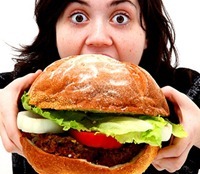 Those with binge eating disorder will often eat massive amounts of food, even when they are not hungry. They eat when they are alone, eat very fast and continue even when they are physically uncomfortable. They often feel depressed or anxious about their habits, and try to hide them from family and friends. They might lose weight and then put it back on in a “yo-yo” dieting cycle. Complications. Many complications accompany binge eating disorder, including depression, anxiety, thoughts of suicide, obesity, heart disease, headaches, joint pain, gallbladder problems, high blood pressure, high cholesterol, type 2 diabetes and other medical issues that can result from an unhealthy diet. Risk Factors. Some of the risk factors for developing this disorder include psychological issues, family history and other hereditary factors, long-term problems with dieting and age, as most cases begin in the early twenties or late teens. Home Remedies. Home remedies can include eating on a regular schedule, avoiding dieting, getting the right nutrients in your body, staying connected to family and friends and obtaining counseling if necessary. Medical Treatments. Psychotherapy in individual or group sessions can help. These can include cognitive behavioral therapy, interpersonal psychotherapy and dialectical behavior therapy. Other options include medications, self-help strategies and monitored weight loss programs. Bulimia is a very serious eating disorder that could be life-threatening if not treated. Those with bulimia will often eat large amounts of food and throw it up shortly thereafter. This binging and purging cycle can do significant damage to your body. Those who suffer from bulimia nervosa might have serious emotional issues as well, such as judging themselves harshly for perceived physical flaws and having a very negative self-image. Symptoms. Symptoms of bulimia include being very harsh with yourself about your body image, feeling depressed or anxious about gaining weight, binging to the point of pain, purging on a regular basis, using herbal supplements for weight loss and abusing enemas, laxatives and the like. Complications. Constant vomiting can lead to serious problems with your health, including heart problems, tooth decay and gum disease, lack of a period for women, dehydration, and digestive problems. The anxiety and depression can also lead to problems with drugs, alcohol and the like. Risk Factors. Females in their late teens are most susceptible to this eating disorder. Those who have a complicated body image, feel pressure in sports or society, and have a close relative who has dealt with bulimia are more likely to have this problem. Home Remedies. Potential remedies for this condition include being cautious with exercise, staying social with family and friends, avoiding dieting, getting the right amount of nutrition and sticking to any treatment plans recommended by your doctor. Medical Treatments. Potential treatments include medications and nutrition education, as well as hospitalization for the problem. Psychotherapy, including various forms of counseling, might also be recommended. Anorexia is marked by obsessive thoughts about weight and food, as well as a desire to maintain a weight that is much lower than it should be. People with anorexia often starve themselves in order to meet an ‘ideal’ weight, and they might also exercise obsessively if they do eat. It is important to remember that anorexia actually has nothing to do with food, and everything to do with emotional issues. Symptoms. Anorexia often has several terrible side effects, such as excessive weight loss, thinning hair, dry skin, constipation, intolerance of cold, heart problems, dehydration, osteoporosis, dizziness, fainting, abnormal blood counts, aversions to food, and swelling of arms and legs, among other related symptoms. Complications. Heart problems are common with those who have anorexia. Other problems include absence of a period in females and lowered testosterone in males, electrolyte imbalances, kidney problems, bone loss, anemia and even death. Risk Factors. Young females are most at risk, especially those who have dealt with serious life changes or a family history of anorexia. Other risk factors include sports and work activities that require thinness, weight changes, genetic predisposition and media or society pressures. Medical Treatments. Treatments for anorexia can be extensive, including hospitalization or care in a rehabilitation facility, medications, psychotherapy, help in achieving a healthy weight, and medical care for the complications of the disorder. In addition to these disorders, there are many other eating disorders that can cause problems with your body and your psyche. This list of eating disorders can help you understand what problems you might be facing. Anorexia Nervosa. An obsession with maintaining a very low weight, often marked by starving yourself or exercising excessively. Bulimia Nervosa. Binge eating followed by purging, as well as unhealthy obsessions with body image and weight. Binge Eating Disorder. Also known as compulsive overeating, this includes eating until you are uncomfortable, and doing it over and over. Pica. An intense craving for non-food items, such as chalk or clay or dirt. EDNOS. Eating Disorders not otherwise specified, this is diagnosed in those who have the signs of anorexia or bulimia but don’t fit neatly into those categories. Rumination. The process of eating food, throwing it up, then eating it again. Diabulimia. A practice by diabetics in which they withhold insulin in order to lose weight rapidly. Orthorexia Nervosa. An obsession with avoiding unhealthy foods that becomes so strong it interferes with proper nutrition. Drunkorexia. The act of eating less food in order to have more room for alcohol calories. Pregorexia. Excessive dieting, exercising and other actions to avoid weight gain during pregnancy. Night Eating Syndrome. Where the urge to eat only happens at night, and sometimes the sufferer will eat without being aware of it, such as while sleepwalking.